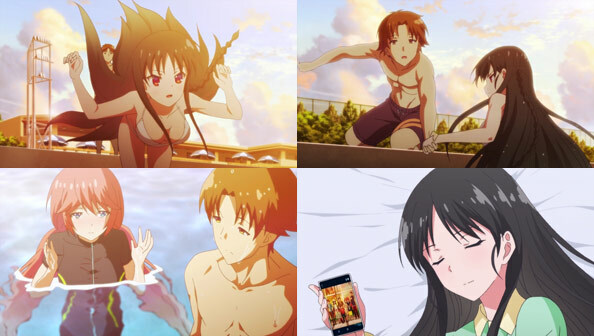 This week the happy little world of Nishikata and Takagi is invaded, as the secondary characters begin to notice the two are together an awful lot beyond class. Take the first segment, in which Nishikata has to clean the science room because he’s so loud. Takagi joins him, not to help clean, or because she feels guilty, or even to tease him more. 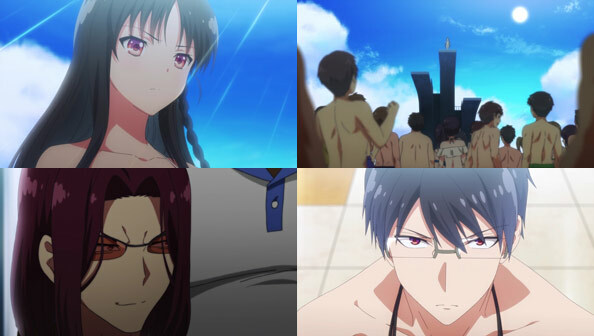 Rather, she wants to “enjoy their youth”, the way another couple is clearly doing when they spot Nishikata and Takagi on the way to the rooftop. 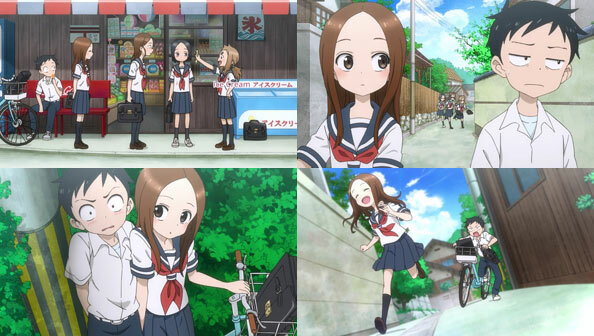 For Takagi, enjoyng her youth means spending as much time as she can with Nishikata. Clearly Nishikata doesn’t mind hanging out with Takagi that badly, even if she does tease him a lot. Indeed, he seems to savor the challenge of fighting against such a formidable opponent, and never lets the discouragement of virtually never winning against her get to him for very long. While on the way home, Nishikata challenges Takagi to a high-bar kickover, something he’s only just recently mastered. Takagi agrees to do it, but only if he looks the other way, as she’s wearing a skirt. The first time they both do one, but he doesn’t know whether she cheated, so the next time, he peeks. When he does, he learns not only that Takagi is doing proper kickovers, but is wearing gym shorts under her skirt. But even if she made him look away despite that, he’s honorable enough to admit defeat because he peeked, even if she calls him a pervert. Nishikata often shows he’s a good lad, but his desire to best Takagi sometimes leads to unnecessary deceit. When he comes in with an apparent cold, Takagi immediately presumes it’s because he stayed up all night watching 100% Unrequited Love anime. Nishikata intends to make Takagi blush by telling her she’s “cute”, but ends up too embarrassed to say something meant to embarrass her. He’s so thrown off he claims to not have a cold after all! 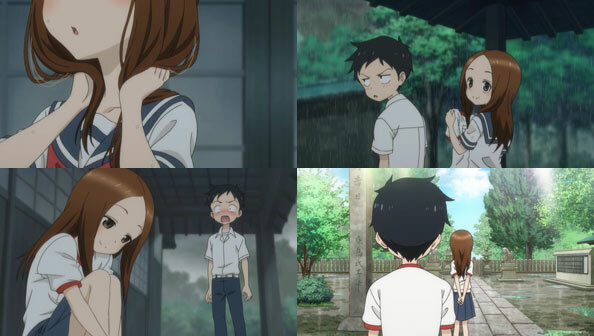 While Takagi still believes he has a cold (which he actually does), she seems frustrated she can’t tease him as usual lest she make him cough, so when he later insists he’s fine (after watching how damn cute she is when sitting quietly), she just starts teasing him even harder to make up for lost time! 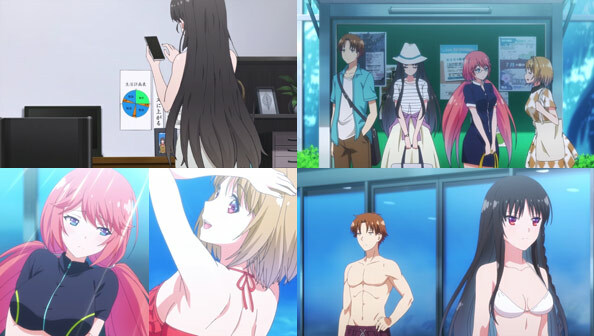 Finally, Nishikata and Takagi are spotted by the three girls. Yukari assumes they’re a couple and decides to tail them to confirm it. Takagi being a particularly observant person (and the trio not being that stealthy), she and Nishikata take a quick turn around a corner and then hide, throwing the girls off the trail and causing them to give up. In the process, Nishikata and Takagi have to squeeze together very close—closer than under the umbrella last week—and Nishikata is understandably flustered, but when asked if he would have preferred a different tactic, he drops the matter. Takagi then immediately sets off on the race to the shrine they proposed. Nishikata cries ‘false start’, but honestly, the only thing he can and should do in such a situation is chase after Takagi…which he does. 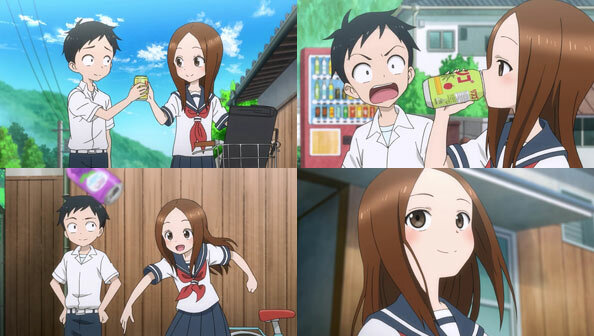 When Takagi spots Nishikata and suggests they walk home together, Nishikata offers her some of his drink, thinking she won’t go for an “indirect kiss.” Of course, she’s fine with it; it’s Nishikata who wigs out at the prospect. 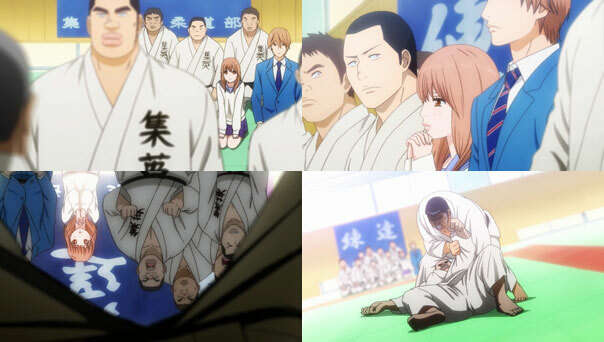 Nishikata then makes a fluke shot with the empty can in the garbage can and gets all cocky when Takagi misses. Turns out her miss was a trap; her next shot goes right in, then interrupts his shot by saying she’ll give him her first kiss if he makes it. He misses. 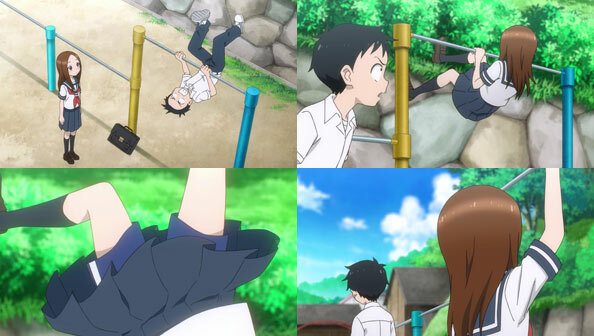 The next day Nishikata estimates he was teased fifteen times by Takagi, so when he hears form a sports figure on the TV that he trains ten times harder when he loses, he begins doing pushups. At school, he’s all sore, and Takagi takes advantage by poking his arm. Nishikata keeps up the training, despite the fact Takagi teases him more and more with each passing day. However Takagi later admits that she’s starting to notice the effects of the training, saying he “looks pretty good;” while she may be sincere, she’s also trying to make him blush, and she succeeds. Finaly, on a rainy afternoon Takagi forgets her umbrella, so asks Nishikata if he can share. He tries to scare her with a frog, but it doesn’t faze her in the least, and when she notices his wet shoulder, she scoots closer to him, causing his heart to race even more in such an awkward situation. In all three segments, Takagi is both testing and expanding the limits of contact with Nishikata, all while inducing the priceless reactions she lives for. It gets to the point where she tries to get Nishikata to say “I love you” in both Japanese and English. He bristles as expected, but some day, perhaps a couple years from now, he might not think all this attention from and contact with Takagi to be so torturous. Nishikata, believing this an opportunity to get Takagi to stop teasing him, first writes”restraint”, but she writes “status quo.” When he writes “kindness”, Takagi suddenly seems really kind, even though she didn’t see what he wrote. Finally, he decides not to dance around it anymore, and simply writes “Don’t tease me,” then backs it up with direct spoken words as well. Takagi really enjoys teasing him, but she says she’ll “try her best” not to. Of course, she wrote her calligraphy before making that promise: “You have ink on your face,” and she put it there while acting kind! Mind you, she kinda cheated by writing what was on him instead of what she wanted from him. Alas, Nishikata is too embarrassed to point that out. 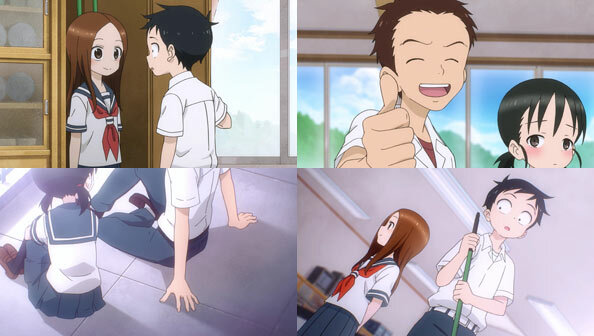 Nishikata finally gets a relatively clever idea: it’s June 18th, and Takagi is student #18, so he tries to distract her so that when the teacher calls on her, she’ll be unprepared. The plan seems to succeed at first, with Takagi even betraying a half-moment of flustered-ness we’ve come to expect of Nishikata. But when called upon, she knows exactly what line to read. 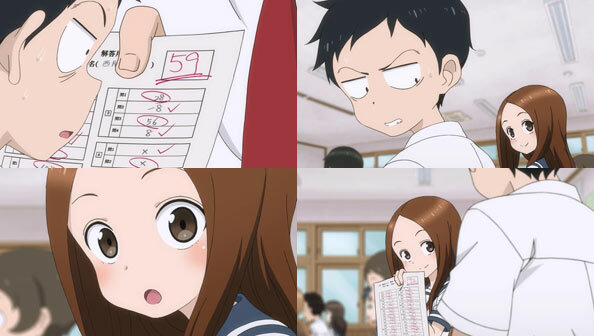 Noticing Nishikata looking at her, Takagi turns the tables by saying she’s “always thinking” about Nishikata, and the teacher decides to add the month and the day to select Student #24…Nishikata. And yet, for all her teasing, you get the feeling she’s being honest about thinking about Nishikata a lot, just as he thinks about her. Teasing Nishikata is Takagi’s way of expressing her interest in him, it’s just that he’s so wound up in the cycle of teasing, he either overlooks the underlying affection or suspects it as another layer of teasing. And it’s often both! That inability to ever interpret Takagi correctly rears its head in the final segment, “Pool.” Nishikata can’t swim due to a bandaged hand, and to his shock, Takagi is also sitting it out. She correctly guesses that his hand was injured when he tried to pet a stray cat, so she asks him to guess why she’s not swimming. When she holds her stomach, he remembers a classmate saying girls on their period don’t swim and experience abdominal pain. But he doesn’t want to say that, because it’s generally considered rude. Searching for another reason, he remembers another sage classmate telling him small-chested girls are self-conscious about their chest size. This time, we get visualizations of how Nishikata thinks the interactions with Takagi will go after giving each answer. When he also remembers that periods are nothing to be ashamed of, he finally guesses that, which is wrong…and rude, says an apparently offended Takagi. 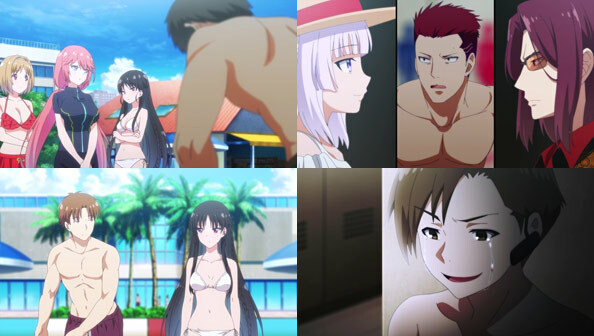 However, she immediately laughs afterwards, then slowly removes her shirt and shorts in front of Nishikata to reveal her school swimsuit. Turns out she only stayed out of the pool so she could tease Takagi. She says hopefully next time they’ll be able to swim together. Takagi is dubious as always, but I don’t doubt Takagi’s sincerity in the slightest. So till then, Nishikata, avoid stray cats! After sustaining a head injury when Zapp punts him into a bad guy, Leo has the same dream he always has: Michella sacrificing her sight and legs for his sake while he stands around doing nothing. We’re reminded of the prime reason Leo is in Hellsalem’s Lot: to cure her. He shows Dr. Estevez his eyes, but neither she nor Director Grana have ever heard of a case of them being removed. It’s not a medical procedure; more a termination of a contract, which won’t come without considerable cost. Leo laments that he feels as powerless to save Michella as he was the day he arrived. Klaus told him there’s always light, but he can’t see it. Then the magic, intensity, and downright insanity of simply living in the HSL, not to mention being affiliated with Libra, eventually restokes his hope of saving his sister, thus becoming the “turtle knight” who protects the princess in Michella’s drawings. How specifically does he get inspired? A lockout! While Steven is hacking computer systems to stop criminals from bringing down earthshaking beings who rain destruction upon the city, an old foe believed to have been incarcerated surfaces, and all of Libra goes out to deal with it, when only Steven was needed. 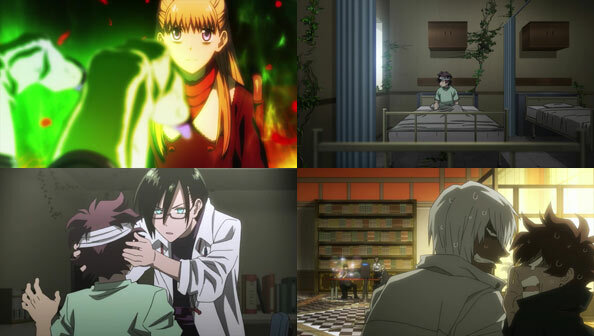 Only Anila remains at Libra HQ, and a single crane fly who had infiltrated the interior soon turns into a massive swarm, and one of them evolves into a humanoid of increasing intelligence and power. He sets Defcon 2, turning Libra into an impregnable fortress, with the bulk of Libra’s members trapped outside. Klaus calls Yurian, a Ghostbuster-looking “locksmith” to override the lockout, but it will be slow going. Meanwhile, the team can’t prevent Chain, entering HQ in her usual way, from getting blasted by the building’s defense systems. She’s fine, and even caught a glance at the bugs, whose leader becomes more and more sophisticated in speech as he talks to Klaus over the phone, basically saying he’s borrowing HQ until he becomes a god. The delay of Bugman’s evolution could spell the end of the city, as a particularly large Earthshaker begins to descend, adding far greater stakes to the emergency than simply being locked out of a house when the oven was left on. 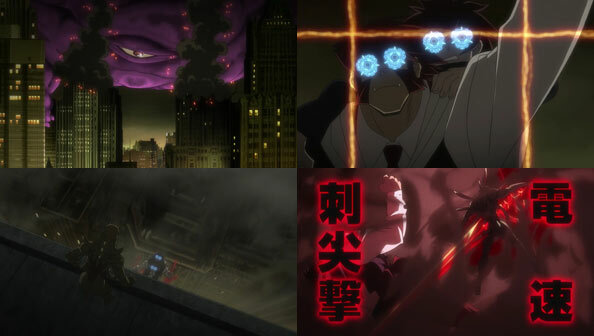 However, Klaus doesn’t panic; he turns to his training and his ability, has Yurian open the tiniest of holes in the defense system, and climbs the tower with blood pitons, using Leo’s eyes to discern when to avoid the security grid. Demonstrating he’s not quite ready for godhood, the Bugman idiotically goes outside to see what’s up and gets blood-lanced. Steve tracks down the hackers controlling the Earthshaker and take them out before it touches the ground, saving tens of thousands. And thus, having watched Klaus not giving up while riding on his back, Leo resolves not to despair or give up on saving Michella. After all, you never know what this city will throw at you. Takamiya Honoka’s innate magical power is so great that when he’s in Kagari’s proximity, she’s virtually invincible. This begs the question: why hadn’t Honoka ever been attacked while Kagari wasn’t around? They’re close, but they’re hardly inseparable. 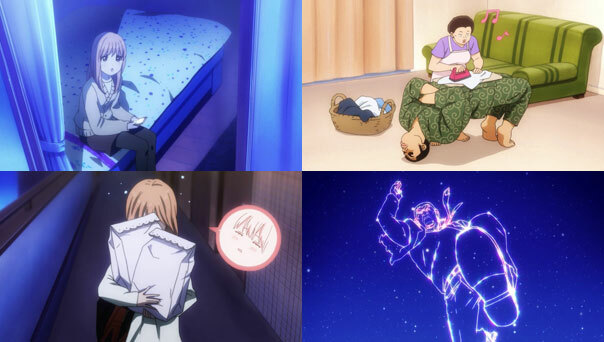 This episode answers that question, both for us and the Tanpopo-led Tower Witches who make another ill-fated attempt to attack Honoka: someone else is protecting him. Namely, his little sister Kasumi (a very sharp, indignant performance by Kayano Ai). In hindsight, we should’ve known Kasumi would step out of the shadows and margins of the frame and have a bigger presence, but we didn’t think it would be this fast or this big. Frankly, we liked the idea of keeping her in stealth-stalker mode for a few more episodes, but the whole reason she was doing that turns out to be because Kagari was stepping on her toes by hanging out with Honoka on a weekend. Kasumi is a jealous, possessive imouto who is resolved to protect her brother, who while slightly taller is far weaker in the magical tactics department. 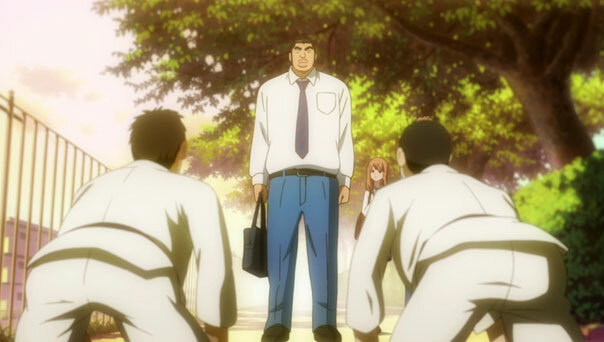 Faced with the intolerable prospect of more of her precious time with her beloved brother being sapped away by the Princess, Kasumi takes action, subjecting Honoka to a tense bathroom interrogation, then (successfully) guilt-tripping him by mentioning she’s being picked on by the masses at school upset with his closeness to said Princess. 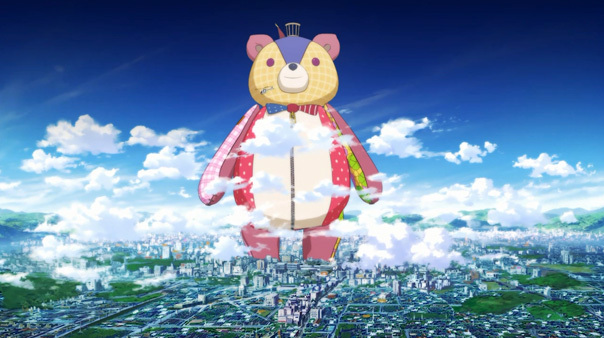 But when Tanpopo’s crew distract Kagari, it’s up to Kasumi to save Honoka, arriving atop a gargantuan stuffed bear. Tanpopo counters with a giant rabbit, and a huge, silly fight ensues, resulting in much destruction of property, but ultimately not as fun as last week’s broom ride. Yet again, the baddies look like hapless fools, with two exceptions: Chronoire, low on mana after her first encounter with the “King and Queen”, smartly uses Tanpopo’s crew as pawns to keep the pressure on, and later collects all 30-odd Tower witches in town for a powwow. 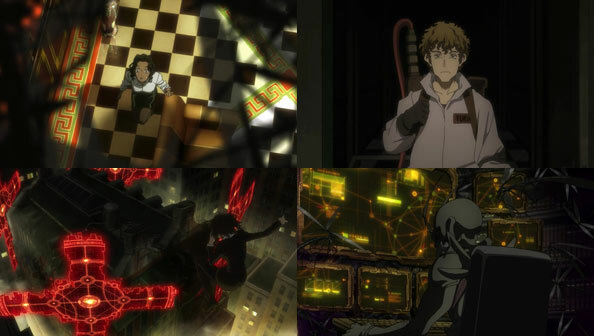 All the while, Tanpopo’s crew’s boss, Medusa, has escaped from SuperMax confinement, meaning we could soon see an “if you want something done right, do it yourself” scenario. Still, after their impressive displays of power and collective devotion to Honoka, we don’t expect Kagari or Kasumi to shrink in the face of whatever evil threats are converging.